The Classic Facial is the essential building base to beautify your skin. 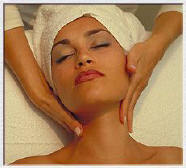 First, skin-nourishing, muscle-soothing, tension-dissolving creams are massaged onto your face, neck, and shoulders. Next, a skin-softening steam preps your face for a gentle extraction of impurities. The finale is the application of a pore-tightening, skin-smoothing masque, customized for skin type. Whether you are experiencing a facial for the first time and need to determine your skin type or you receive facial treatments regularly, the Classic Facial is sure to rejuvenate you, give you a glow, and beautify your skin.